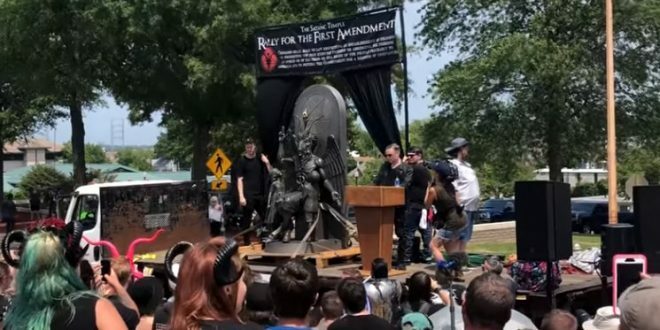 ARKANSAS: Satanic Temple Delivers Statue To Capitol In Battle Over Ten Commandments Monument [VIDEO] - Joe.My.God. Dozens attended a rally held by the Satanic Temple at the Arkansas State Capitol on Thursday. The rally comes after the Arkansas legislature approved the placement of a Ten Commandments monument on the Capitol grounds. During the Satanic Temple’s Rally for the First Amendment, a more than 8 feet tall Baphomet statue was unveiled. “The event is intended to be an inclusive gathering where The Satanic Temple will be celebrating pluralism along with Christian and secular speakers. People of many faiths will come together at the Capitol to reject the Arkansas State Legislature’s efforts to privilege one religion over others,” explains Lucien Greaves, spokesman and co-founder of the Satanic Temple. Our rights to build a monument were exercised through the electoral and legislative processes and have been upheld by the judicial system. They are no less sacred than the freedoms of a shrill few, for whom legal and political rights are merely methods to fleece the gullible and entertain the cynical. No matter what these extremists may claim, it will be a very cold day in hell before an offensive statue will be forced upon us to be permanently erected on the grounds of the Arkansas State Capitol. Our Supreme Court ruled in the 2009 U.S. Supreme Court decision Pleasant Grove v. Summum that no group can force a government body to do such a thing.